In recent years, Camellia sinensis or Yunnan Tuocha Tea has been researched for helping to maintain healthy cholesterol levels. Tuocha is an ancient sub-species of the tea plant, grown in the Yunnan province of China. It was traditionally used by herbalists to help promote balanced health and the digestion of fat. This is a delicious, mild-tasting, beneficial black tea, good to drink everyday. While regular green, black and oolong teas, “cha”, are made from the tea plant, Camellia sinensis, Yunnan tuocha tea, is one of a few teas known as “pu-er cha. “Tuo cha” means bowl-shaped tea. It refers to the method of shaping the pu-er-tea during drying. 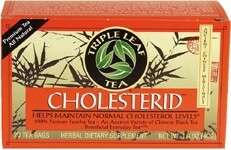 Experts recommend drinking three cups of this tea everyday. Try it hot or iced, plain, or with lemon and sweetener. Drink it along with any of our green or decaf green teas for additional support in helping to maintain healthy cholesterol levels.